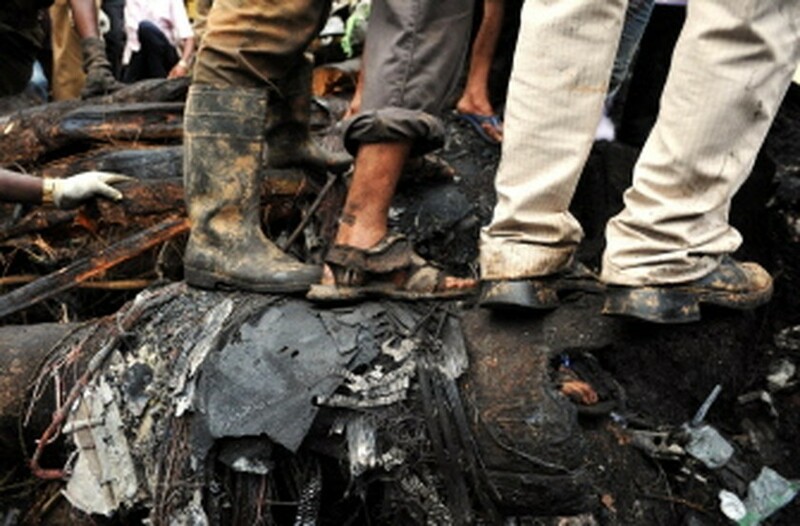 MANGALORE, India, May 23, 2010 (AFP) - Investigators on Sunday face the gruelling task of sifting through the wreck of an Air India Express plane that overshot the runway and plunged into a ravine, killing at least 158 people. The Boeing 737-800, carrying 160 passengers and six crew on a flight from Dubai, careered off the end of the "table-top" runway at Bajpe airport and plunged into a forested gorge where it was engulfed in flames. Survivors of India's worst aviation disaster in 14 years described hearing a loud thud shortly after touchdown and said the main fuselage broke into two before filling with fire and thick smoke. The probe into the crash, just outside the port city of Mangalore on India's west coast, was called off in darkness on Saturday night. Investigating teams were expected to resume combing the wreckage during daylight on Sunday, with efforts focusing on finding the "black box" cockpit data recorder that they hope could shed light on the cause of the disaster. Officials described the landing conditions as fair with good visibility and said there had been no distress call from the cockpit. Civil Aviation Minister Praful Patel, who flew to the crash site, said eight passengers had survived. Overnight Air India released the names of seven survivors. It was the country's deadliest crash since 1996 when two passenger planes collided in mid-air near New Delhi with the loss of all 349 on board both flights. One survivor, Umer Farooq, told the NDTV news channel from his hospital bed that he had heard a bang as the plane touched down. "The plane veered off toward some trees on the side and then the cabin filled with smoke. I got caught in some cables but managed to scramble out," said Farooq, who suffered burns to his arms, legs and face. Television images from the immediate aftermath of the crash showed smoke billowing from the fuselage, as emergency crews, who struggled down steep, wooded slopes to reach the aircraft, sought to douse the fire with foam. Hours later, rescue workers were still pulling blackened bodies -- some of them strapped upright into their seats -- from the remains of the burned-out fuselage. "The preliminary observation is that the aircraft touched down and did not contain itself within the runway space," Patel told reporters. He described the chief pilot, a Serbian national, as a "very experienced" flier who had logged 10,000 hours of flying time. Stressing that it was "too early" to determine the precise cause of the crash, Patel noted that the sanded safety area surrounding the runway in the event of an overshoot was shorter than at some airports. "It does not have much of a spillover area (and) in this case apparently it had not been able to stop the plane," he said. Air India Express is budget airline operated as a subsidiary by the state-run carrier. In a statement, US-based aircraft manufacturer Boeing said it was sending a team of investigators to India to help in the inquiry. The last major plane crash in India was in 2000, when 61 people were killed after a passenger jet plunged into a residential area near the eastern city of Patna. Saturday's disaster came as Air India is struggling to turn around its finances after posting a net loss of more than one billion dollars last year.